Capt. Mark Vandroff is the DDG 51 program manager, PEO Ships, Naval Sea Systems Command. Vandroff graduated from the U.S. Naval Academy in 1989 with a bachelor’s degree in physics. In December 1989, he graduated from Johns Hopkins with a Master of Science in applied physics. He reported to Pre-Commissioning Unit Arleigh Burke (DDG 51) in July 1990. He served in a variety of division officer roles and deployed to the Mediterranean and Red seas in support of operations in the Balkans and Iraq. During a department head tour on USS Gonzalez (DDG 66), Vandroff served as combat systems officer and post shakedown availability coordinator. After attending the Engineering Duty Basic Course, he reported to SUPSHIP Pascagoula, Miss., in March 1999 as the Aegis test officer, and in March 2002, he reported to PEO Ships as the Aegis Shipbuilding Combat Systems, Test and Trials division head. In October 2004, he reported to the Office of the Assistant Secretary of the Navy (Research, Development, and Acquisition) as director of surface combatants. From February 2007 until December 2008, he served as director of Fleet Introduction, Testing, and Requirements for the LPD 17-class amphibious dock transport ships. During this time, he completed initial operation and live-fire testing on the LPD 17 class. Vandroff served as executive assistant to PEO Ships before his present post. Please talk a little bit about the history of the DDG 51s, and why we had to build a class of destroyer that was not only stealthy but had Aegis on it. The Arleigh Burke-class DDGs started out as a fairly straight-up replacement for the Charles F. Adams [DDG 2]-class ships. There were 23 U.S. Navy Charles F. Adams-class destroyers [plus six others for foreign customers] and they had reached end of serviceable life. That’s why, if you read the original program documentation of the Arleigh Burke, it was 29 ships to replace those Charles F. Adams-class destroyers. So, it was just a one-for-one, maintain the existing force structure. Well, interestingly enough, I would think of it as a lesson of things that work. That which gets rewarded gets repeated. So, you have a very successful cruiser program [Ticonderoga-class (CG 47) Aegis cruisers]. The Arleigh Burke-class DDGs started out as a fairly straight-up replacement for the Charles F. Adams [DDG 2]-class ships. There were 23 U.S. Navy Charles F. Adams-class destroyers [plus six others for foreign customers] and they had reached end of serviceable life. That’s why, if you read the original program documentation of the Arleigh Burke, it was 29 ships to replace those Charles F. Adams-class destroyers. So, it was just a one-for-one, maintain the existing force structure. Aegis had already been wrung out and tested on the Ticonderoga-class cruisers. It was continuously improved in subsequent “baselines” [hardware/software configurations]. So if you look at the baseline for cruisers of the day, like the USS Chosin [CG 65] as one of the hull numbers that that was being built about the same time as the Arleigh Burke, which was the baseline for destroyers, the combat systems were virtually indistinguishable from each other. The basic functionality of Aegis and the basic components were virtually indistinguishable. It basically took the Chosin’s Aegis combat system and put it on the new hull of a destroyer. The outside of the ship was different, but it was basically a straight-up replacement for the Charles F. Adams-class destroyers. What gets interesting is that once you build the first 28 of those Flight I/II ships – because it’s hard to tell the difference between a Flight I and a Flight II [Flight II added an organic signals intelligence capability to the ship that required a small redesign of the deckhouse] – the Navy was left with a “what to do next” decision for surface combatants. And, when you look at the top-level requirements for what became the Flight IIAs, the decision was to add the helicopter hangar on them. Let’s talk a bit about the displacement growth that came with the II and the IIA Burkes. You talked about having 1,000 tons of growth margin projected on the Flight Is. How much of that 1,000 tons did you eat up in the development and production of the IIs and the IIAs? Or did you start with a new baseline and still have 1,000 tons when you were working with those ships? You don’t have quite 1,000 tons, but on the Flight IIAs, you have close to that. And while I don’t want to get into the naval architect kind of details, you start asking yourself how much can a ship “sink” and still maintain its stability. And part of that has to do with how high up on the hull you put in openings that aren’t necessarily watertight. So if you reposition your openings you might have the ability to be heavier and still be safe. So when we went to the IIA, the naval architects have a cool term of what’s called the “V-line” of the ship, which is where you put your openings, in layman’s terms, such that you can still maintain stability, and not have free communication to the sea. You still have a good, almost 1,000 tons of give on the Flight IIAs based on where her “holes” are. I also remember the IIAs have a little bit different hull form, too, because from frame 300 aft you’ve got the helo hangar, and you also change the stern and the flight deck on the Flight IIAs, and that gives you a little bit more volume under the water that helps you with your allowable weight. So they’ve got a pretty good margin on the IIAs. You aren’t delivering those with quite a foot of KG [also known as the vertical center of gravity] margin anymore, but you’ve got well over two thirds of a foot as we deliver them today. And, you know, if the IIAs continue to burn KG like the Flight Is did, that should be sufficient to get them through their service lives. What about the Flight IIIs? Will you have appropriate margins for them to grow in their service lives? I think we definitely will in weight. We definitely will in power. My biggest technical challenge right now is stability. I feel pretty good that I can get half a foot of [KG] margin on the current design and I’m looking for ways to make that half a foot a bigger number. If you look at Arleigh Burke and a 35- to 40-year service life, half a foot seems like the minimum you would want, not a comfortable number, which is why in design, as we continue the preliminary [design] and start detailed design, that’s like my No. 1 technical issue – increasing the amount of stability margin that we deliver those Flight III ships with. The Air and Missile Defense Radar [AMDR] is a great radar, but compared to SPY-1D, a lot more of the weight is up high on the deckhouse rather than down low, because a lot more of the functionality is in the array face. The array faces are heavier, and that’s all up high. So, the Navy, I think, has settled on half a foot as the minimum we would want to accept in order to get a reasonable service life on KG [out of the Flight IIIs], and I’m confident I can provide that. I think we’d be more comfortable if I said it’s going to be two-thirds of a foot and that’s a goal that I’m working towards, but I’m not there yet. On a ship of 10,000 tons displacement and 500 feet in length, lowering the center of gravity by an inch is a big deal. It takes a lot of weight movement on something that size to move the center of gravity down an inch. So yes, I’m fighting to move the inches at center of gravity down. A few inches would do me a lot of good. But, I’ll also tell you there is a balancing act here. On the first few Arleigh Burkes that had a foot of service life of KG, where I served, you get the opposite effect. If your center of gravity is too low, and you get into heavy seas, the ship so wants to get back to centerline that it whips back and you get a very fast back and forth like a metronome in a sea state. So, what you want is a ship that rights itself in a sea but does so at a not-too-slow, not-too-fast kind of reasonable period that makes for a comfortable ride, where you’re not banging things around and [running] the risk of the ship damaging itself if it vibrates too quickly in a sea. How were the anti-ballistic missile and anti-satellite capabilities added to Aegis, and how fast are they being added to the DDG 51 force? Let me talk about new construction, and then I’ll go backwards from there. 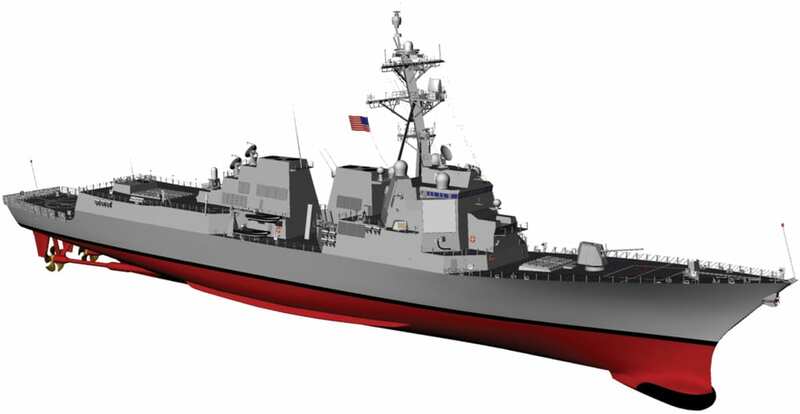 In new construction, what we call Integrated Air and Missile Defense [IAMD] will be on the first of the “restart” ships – DDG 113. The key there is to replace the SPY-1 radar signal processor with what we call the Multi Mission Signal Processor. That allows SPY-1 to provide air defense in what is called the air-breathing environment [cruise missiles, aircraft, etc. ], while at the same time providing engagement against exoatmospheric threats [ballistic missiles, satellites, etc.]. That will start on DDG 113. IAMD is being driven by the computer program that MDA [the Missile Defense Agency] is providing us – BMD [ballistic missile defense] 5.0. And then on into the first few ships of the multiyear procurement, starting mostly with DDG 119, that will deliver what’s being called Advanced Capability Build 16 that’s in development now, and will become what we call BMD 5.1. That will increase the range of threats that the ship is able to deal with. So, that’s what we’ve done in the new construction world. Before I go to the next generation beyond that and talk about Flight III and AMDR, let me go to the back-fit. MDA and PEO IWS [Integrated Warfare Systems] working together have provided a BMD capability for different threats in previous Aegis baselines [BMD 3.X and BMD 4.X] for the in-service ships based on their original Aegis baseline. The key with that is that it’s not an integrated capability. You basically tell your signal processor to stop doing AAW [anti-air warfare] and start doing missile defense. So the ship that’s doing missile defense with BMD 3 and BMD 4 cannot be doing anti-air warfare against air-breathing threats simultaneously. With BMD 5, which starts on Baseline 9 configuration, you can do both AAW and BMD at the same time. Baseline 9 not only provides the software for doing both at the same time, but also is the correct equipment doing it at the same time. That capability has been back fitted onto the USS John Paul Jones [DDG 53], and she is in the process of testing that capability. So she presently has almost the same capability that DDG 113 will have. And we have availabilities [upgrades/maintenance] going on presently on Barry (DDG 52), Stout [DDG 55], and Benfold [DDG 65], which are in the middle of their availabilities, and Arleigh Burke starts hers in 2014. The plan is to continue to populate that Baseline 9 capability on the early DDG 51s as they reach their midlife. I’ll go back to the Budget Control Act: That assumes we have money to do that going forward. In today’s budget environment, that gets to be a series of hard choices to do all that. But that’s the Navy’s current plan of back fitting that capability. Now, the next way of getting greater BMD capability is you need to have a radar that can produce radar dwells that are more powerful and frequent than the SPY-1 series, in order to cover a larger volume of space and handle more threats at the same time. And that explains why we are doing Flight III: the AMDR radar. It’s the next generation of phased array radars that will take you to more powerful, more sensitive radar that’s able to track more exoatmospheric targets at the same time than the SPY-1D(V). You’ll marry that up with the BMD capability to process and handle the enlarged threat set, and that’s the rationale behind the Flight III Burkes. AMDR will have a radar controller that controls both the AMDR-S band and SPQ-9B X-band radars. The reason you put an X-band radar aboard is to relieve your S-band radar of having to search the volume of space around the ship so that you can devote the resources of the S-band radar to searching exoatmospherically while providing yourself defense close-in, which is what an X-band radar is good for. On the first of the Flight IIIs, that X-band solution is going to be provided by the SPQ-9B system, which is a great radar in a lot of ways. It’s very good in close at low altitude, and very accurate. It doesn’t use a whole lot of power and it’s a fairly cheap radar, and because we’re already using it on aircraft carriers and other ship classes, we understand the radar’s performance very well. So, that part is good. Now because it’s a rotating radar, and not a phased array radar, it’s coverage is not as great if we put a phased array X-band on it, but it costs a lot less money, draws a lot less power, and takes up a lot less weight. So, it’s kind of an initial step. It provides us a really good capability for the cost that we are going to spend on that. I think the Navy’s current plan is that at some point in the Flight III class would be to build out the deckhouse some more, and then add in a phased array X-band capability [AMDR-X] to the ship, because depending on what kind of AAW threat you thought you might encounter while you were doing ballistic missile defense, you might want that more capable phased array X-band system. But the SPQ-9B still provides a tremendous amount of capability, certainly against today’s threats and the near-term threats of tomorrow. Again, you have to ask yourself as threats evolve out into the 2030s, 2040s, would [you] make a different decision, but the X-band solution of the AMDR for the first of the Flight IIIs is going to be provided by the SPQ-9B.